Howard Naffziger was born in Nevada City, California in 1884. He attended Berkeley High School, the University of California, Berkeley, and the Medical School, graduating in 1908. During his surgical training at UC, Naffziger was greatly impressed with the surgical skills of Camillus Bush, a fellow Californian with a strong interest in surgery of the nervous system. Bush, a graduate of Johns Hopkins Medical School, ignited young Naffziger’s interest in the new specialty and encouraged his further study at Johns Hopkins. Naffziger went to Johns Hopkins in 1912 where he was accepted as an assistant resident surgeon in William Halsted’s surgical training program. This outstanding opportunity introduced young Naffziger to Halsted’s version of the German surgical model and that of Vienna’s Billroth Clinic. He was introduced to Harvey Cushing, the neurosurgeon who applied the Halstedian principles to the surgery of the brain along with refinements Cushing learned while studying with the great European surgeons, Sir Victor A. H. Horsley and Theodor Kocher. On his return to the West Coast, Naffziger soon became the West’s leading neurosurgeon. 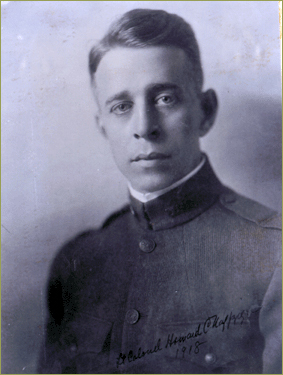 In 1918, Naffziger went to France with his mentor, Harvey Cushing, as a member of the Allied Expeditionary Force. Cushing’s surgical advances were brought to the field hospital by his young disciple. Naffziger summarized the success of battlefield neurosurgery in a manual published by the US Surgeon General at the end of the war. The sign that bears his name was developed by him in the application of jugular compression in the diagnosis of certain spinal conditions. Much of his surgical renown was the result of his elegant publications on the surgical exposure of the posterior cranial fossa and techniques of pituitary fossa surgery, and to his contributions to the treatment of progressive exophthalmos. In 1929, Naffziger was appointed Chair of the Department of Surgery at the University of California, where he developed the first surgical residency program in the western United States. During World War II, Naffziger was Chair of the Subcommittee for Neurosurgery of the National Research Council, and in 1947 became the Chair of the first Department of Neurosurgery at the University of California where he trained a generation of neurosurgeons in the Cushing-Halsted tradition. Naffziger was remembered by his residents and students as a hard taskmaster, often near frightening. Their esteem led to the formation of the Howard C. Naffziger Surgical Society. Naffziger was remembered by the faculty of that period as a man of aristocratic bearing, a man who was not to be counted among one’s enemies. He was a member of some eighteen medical societies and served as president of seven of them, including the American Surgical Association, American College of Surgeons, and Society of Neurological Surgeons. He served on the editorial and advisory boards of six journals of surgery and neurological surgery. In 1952, Governor Earl Warren appointed Howard Naffziger to the Board of Regents of the University of California. In the decade that followed, Naffziger directed his efforts to expanding medical education in California, work that subsequently added three new medical schools to the University of California. In 1954, six of the leading national and foreign journals in surgery and neurological surgery published a special issue in honor of his 70th birthday. The great British neurologist Sir Charles Symonds, head of Neurology at the National Hospital, Queen Square, London, once said that if he were personally faced with a complex neurological problem he would turn to Dr. Naffziger for help in preference to all other men in this field. Howard Naffziger died in 1961, long survived by his wife Louise McNear Naffziger.